Numerology is one of the best scientific studies and tools we can utilize to better understand ourselves, others, events, the world around us, and the Universe. Now that we have discussed all of the single-digit cardinal numbers (1-9), we encounter our first double digit number: The number ten. When we interpret double-digit numbers, a entirely new and intriguingly complex combination of energy occurs. In this article, we will discuss and interpret the energetic vibrations of the number ten. First, we interpret the energy of each number on its own. So for example, if we have the number 14, we decipher the energy of the number one, and then the energy of the number four. We can conclude that the number 14 is a combination of raw pioneering energy (1) and foundation-building worker energy (4). The second number we need to analyze to further understand the energy of a double digit number is what the number is reduced to. In this example of the number 14, 1+4 = 5. So number 14 more so carries the “dynamic and rebellious change” energy of the number five, with attributes of the number one and the number four to create it. Now, in order to comprehend the vibrational energy the number ten exudes, we need to have knowledge of both the number one and the number zero. As a quick review, the number one in Numerology is a pioneer and a doer. It emanates a raw energy of aggressive motivation, new beginnings, and the vibrational power to create reality with intrinsic talents and skills. Even the shape of number one reflects its energy: the confident ability to stand upright as an independent individual. It also is reflects the qualities necessary for leadership, such as: logic, ambition, motivation, and assertiveness. As the number zero is new to us, let’s cover it in totality. After all, it is one of the most fascinating numbers of all. Technically, we could say that the “number” zero isn’t actually a number at all; it has no attributes or traits. However, it is a number because it gives added identity to other integers, or the single-digit cardinal numbers. And when it comes to Numerology, it enhances the energy of whatever number it is with. Number zero reflects both nothing at all, and everything at the same time. It represents: Source energy before creation, eternity, the God frequency, infinity, the beginning, the end, the essential void, choice, and both masculinity and femininity. As it is a symbol of “nothing” but also “everything”, it represents supreme potential – a complete freedom from obstacles in the physical world. Since number zero intensifies whatever other number(s) it is coupled with, with the number ten the energetic frequency of the number one is amplified. Basically, Zero gives off the powerful energy of God, or Source, to the number one – it reflects the perfection of the number one’s meaning. The number ten resonates as an invitation for us to claim all aspects of our lives, and confidently go forward into uncharted territory. Ten creates everything in existence with its leadership qualities and limitless potential. If you can imagine it, it will manifest; if you can boldly put in the work, it will materialize. 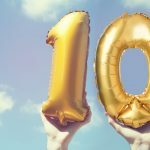 However, with the number ten comes a big responsibility to understand that it is a “make or break” number, depending on the course of action you take. The magical power of manifestation and making creative concepts into reality is there, but you need to utilize wisdom of the lower and higher mind. Because this number has such an intense potential for creation, there is also the intense potential to create destruction. Number ten is also a karmic number, and as a matter of fact, the only karmic number that signifies a release of karma, with new possibilities and opportunities being born on a clean slate. The number ten contains powerful vibrational energies, including: creative power, confidence, individuality, leadership, optimism, originality, independence, adaptability, and success. The visual interpretation of the number one shows us that the 1 stands up straight and independently, with an extremely confident energy to go along with it. This alone reflects the characteristics of leadership that the number one possesses within. It stands firmly on its own, representing a masculine and aggressive nature. The visual interpretation of the shape of the number zero expresses formless flawlessness and purity. It can either hold everything or not. With this we can also look at the number zero as our Universe, holding the entirety of creation inside it. It therefore reflects all potential of every thing in this existence. Note that it is not a perfect circle, insinuating that it has the flexibility to adapt to either end, or grow and shrink at will. It could be seen as empty, but also can represent an egg or creator of life. Just as with the energetic meaning of the number zero, the shape also has conflicted vibrational traits. This is what makes the zero that much more unique – and the reason it influences other numbers so intensely. Capricorn is the 10th sign of the astrological zodiac. It is the Cardinal Earth sign, represented by the glyph of The Goat. The Goat is able to climb ridiculously steep mountains, staying confident on their feet the entire time. Their capability to reach the top defies natural logic, but their self-assured mentality knows they will succeed, which is admirable. This is a perfect metaphor, as Capricorn is possibly the most stable, practical, and disciplined signs of the zodiac. Ambitious by nature, Capricorns are able to succeed at anything they set their mind on, which is tremendously important to their self-worth; being respected and admired is something they crave. Wise beyond their years, they enjoy tradition and being grounded in the physical which enables them to create foundations of lasting value in the material world. They are responsible, level-headed, and the most career-focused sign of the zodiac. In other words, Capricorn is the perfect reflection of the number 10 energy! The 10th card in the Major Arcana is the “Wheel of Fortune” in the Tarot deck. This card reflects a vibrational energy of luck, taking chances, new beginnings, a change in fortune, turning points, life cycles, destiny, life influences, and karma. As with all tarot cards, the illustration of the card symbolizes its deeper meaning. There are 4 figures at each corner of the card: an angel, an eagle, a lion, and a bull. The angel represents Aquarius, the eagle represents Scorpio, the lion represents Leo, and the bull represents Taurus. These four signs of the zodiac are the four fixed quadruplicity signs – yet they’re all depicted with wings, indicating being stable during change and movement. The torah is in their hands, (a symbol of wisdom), and on the wheel are Hebrew letters that mean the “unpronounceable name of God”. The snake on the left is the Egyptian god of evil, with its force descending into the physical. There is an Anubis on the right side, Hermes, who has forever been a representation of higher wisdom ascending. The Sphinx at the top reminds us of the curiosities of life, while the alchemy symbols in the middle of the wheel represent the building blocks necessary to create life: water, salt, mercury and sulphur. The outer circle is the physical realm, and the blue background is symbolic for higher wisdom. When this card appears, it reminds us that there will always be good and bad, or positive and negative in life. But, life does go around in cycles, so even when times are tough, “this too shall pass”. It tells us to remember that if it wasn’t for the darkness, we wouldn’t appreciate the light. The Wheel of Fortune also suggests that we cannot stay stagnant and simply accept life’s circumstances; if it is something negative, work to improve it… and if it is something good, run with it in confidence. Turning points in life will always come, it is all about how you deal with them. The Wheel of Fortune also represents karma (like the number ten), and reminds us not to worry, because that “what goes around comes around”, just make sure that you remember this when you act with either love or with negativity. One of the most powerful numbers, as it is the first number with the intensifier number zero, it has an energy of potential without a ceiling. Leadership and success is vibrationally within, and opportunities are abundant. However, we must embrace this energy in a positive way, to reap the most benefits; the potential for destruction with this number is just as possible. Live in love, be confident and bold, and the Universe will always have your back.